In 1928, after completing his freshman year in college, Lyndon Johnson took a teaching assignment in Cotulla, Texas, a small farming and ranching community about half way between San Antonio and Laredo. His assignment was to teach 5th, 6th, and 7th graders at the Welhausen School, which had been established primarily for the Mexican-American population of Cotulla. Johnson had a deep sympathy for his Hispanic students and the socioeconomic problems they faced. He had enormous energy, a great capacity for work, the initiative to create projects for his students, and the ability to persuade others to assist with those projects. He brought strict discipline into his classroom and organized his young students to participate in debate, declamation, spelling bees, and physical education — opportunities they had never had before. Lyndon Johnson realized that other teachers were not giving the students much attention or incentive to learn. Soon after arriving in Cotulla, Johnson was appointed school principal by W.T. Donaho, school superintendent in Cotulla. 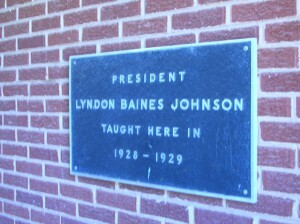 One of Johnson’s first actions was to require all the teachers to supervise the children during recess games. The teachers protested and threatened to walk out, but Johnson prevailed. Seeing a noticeable lack of extracurricular activities at Welhausen School, Johnson soon organized his young students into athletic teams and procured equipment for them. Johnson arranged for them to compete with nearby schools, and, because the school had no buses, he was able to find those few car-owners to help take the children to track meets and debate competitions in the region. 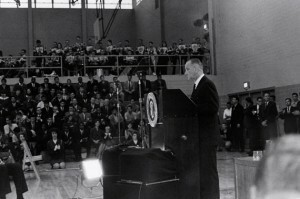 LBJ recalled the significance of his year in Cotulla when he returned to his alma mater in San Marcos to sign the Higher Education Act of 1965, as he explained how his teaching experience affected his commitment to expanding educational opportunities to all students. 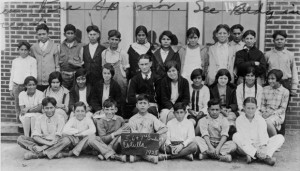 The Welhausen School in Cotulla had been approved by a municipal bond in 1926 and named after La Salle County Judge G.A. Welhausen. This red brick school house, designed by Charles H. Page, features classical elements, with a central block flanked by two low wings, an arched entrance, and decorative tile panels. The skirt roof and grouped windows emphasize the horizontality. When Cotulla integrated in 1970, Welhausen School became the primary grade school for Cotulla I.S.D. Vacated as a school during the early 1980s, the building was leased to the South Texas Rural Health Services in 1985. 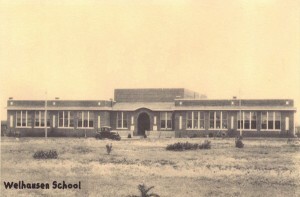 The school became an official state historic landmark in 1990.